The UN Security Council has been given the primary responsibility for maintaining international peace and security. The precise meaning of this responsibility, however, is contested. This lack of clarity is frequently criticised as a source of incoherent and selective decision-making, undermining the legitimacy of the Security Council. In case studies of the Security Council’s controversies on Iraq and Syria, this book instead reveals contestation and competing interpretations of responsibility as crucial conditions for the constitution and negotiation of normative order. The case studies also underline the importance of public Security Council meetings as dynamic sites for coping with a plurality of normative orders and how their symbolic and material manifestations shape processes of collective legitimation. 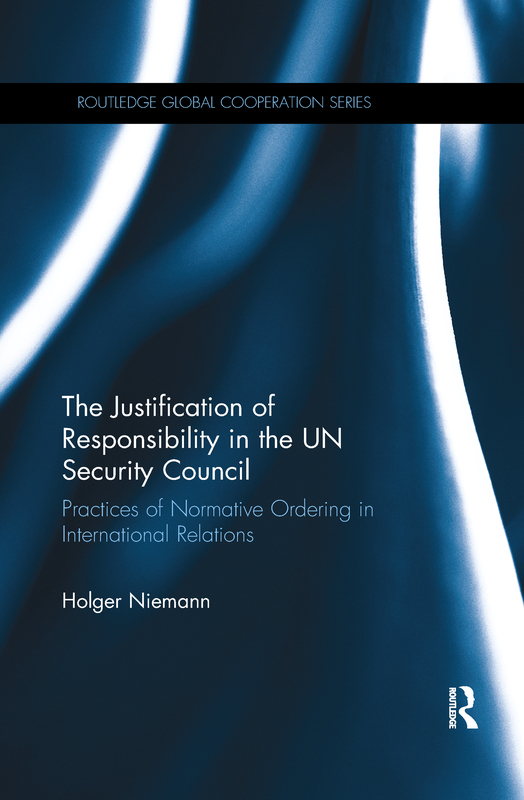 This book concludes that these processes demonstrate the crucial role of justification and critique as practices of normative ordering in the Security Council. The Justification of Responsibility in the UN Security Council argues that normative orders in international organisations are constructed by multifaceted processes of questioning, reaffirming and coordinating claims of normativity and legitimacy. Connecting research on norms and legitimacy in international relations with pragmatist sociology, the book provides an account of the complexities and inconsistencies of decision-making processes and their normative foundations in international organisations. This book will be of interest to scholars and students of international organisations, international relations theory and global governance.